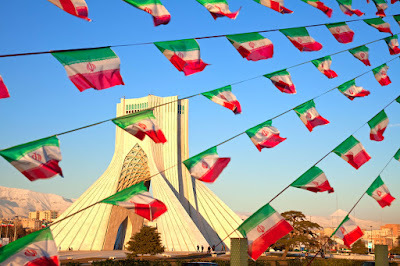 The Iranian national flag is popularly known as Tricolor which means "three Colors". It is a horizontal tricolor in equal proportions of deep green at the top, white in the middle and red at the bottom. The flag has a width-to-length ratio of 4 to 7 meters. At the center of the white band, the national emblem of the word Allah in the shape of a tulip is engraved which indicates the Islamic Republic. The colors of the flag dates back to the mid-18th century, green symbolizes Iran’s nature and prosperity and also represents Islam, white highlights the importance of maintaining peace and red means courage, which shows Iranian people are ready to fight and defend their homeland.